If you chose a standard design, type "Standard". Symbols are noted using (). (heart) = heart symbol, (star) = star symbol. See chart for more options. *Customers located outside the U.S.* Please be aware, orders shipped internationally may incur additional taxes, fees or duties assessed by customs during package clearance. Please see our shop policies for more information. 1. Select your color and size from the first drop-down menu (Color & Size). Please see our size chart (third product photo) or message us if you would like help with a size recommendation. 2. 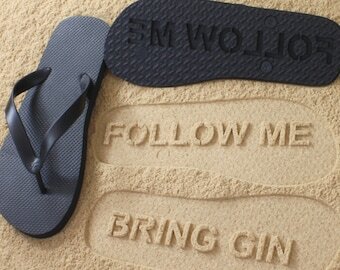 Choose your sand imprint design from the second drop-down menu (Sand Imprint Design). If ordering a custom pair, select “Design Your Own” and add your personalization notes in the box below the drop-down menus. If ordering a standard design (Bring Wine, Bring Beer, Just Married, etc…), you can type “standard design” in the personalization box. If you’d like a standard design to be altered in any way just let us know. 3. Next, click the "Add to cart” button. 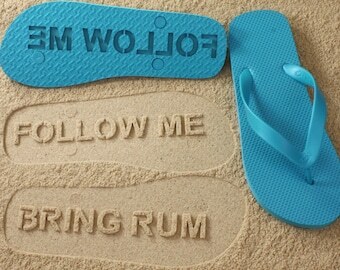 If ordering one pair, you can complete checkout using the instructions Etsy provides. To order more than one pair, continue adding items until you have everything you’d like in your cart before completing checkout. Don’t see the symbol you’d like or have custom artwork? 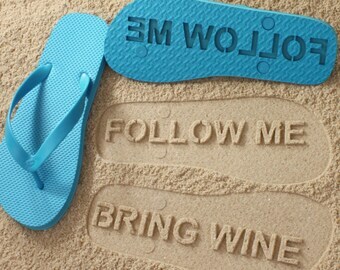 Send us a message! 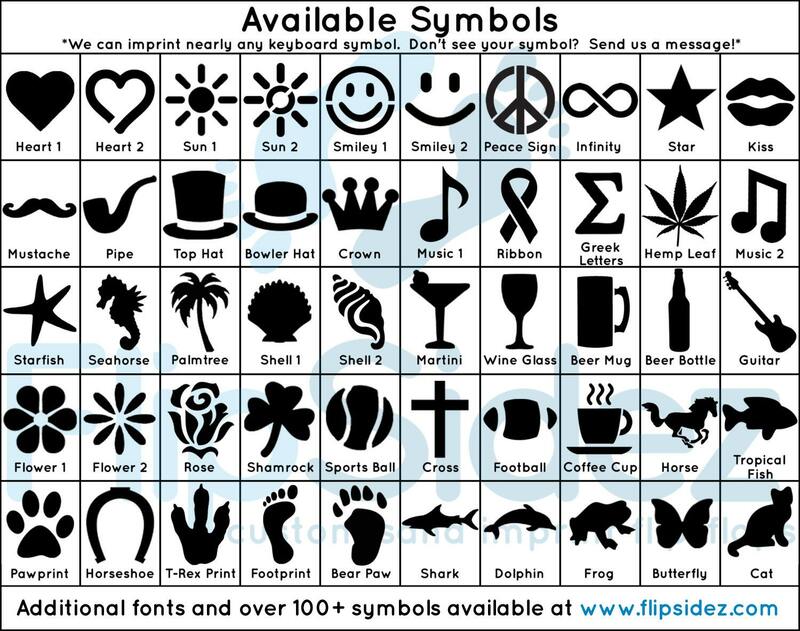 We create custom symbols daily and would be happy to work with you to make your design perfect. 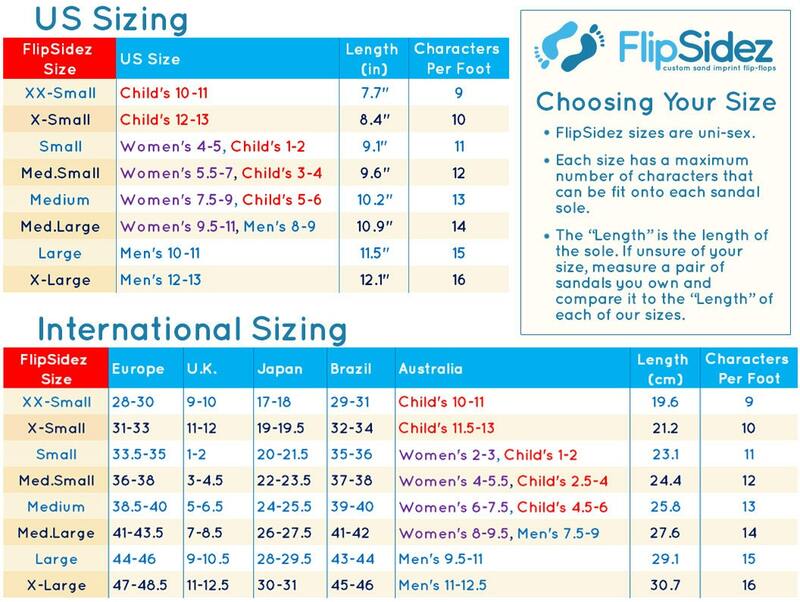 There are limitations to what we can fit onto each flip flop, please refer to our Size Chart to see the character limit of your desired flip flop size. A limit of 11 characters means each shoe can typically hold 11 characters (including spaces). Don’t hesitate to message us with any questions you may have. We are here and happy to help. Domestic (within the US): 5-8 business days for production; then 2-5 business days for shipping. International: 5-8 business days for production; then 2-4 weeks for shipping, barring any customs delays. Click the "Shipping" tab just below the listing picture for the most up-to-date information and policies. Express Shipping is available by request, contact us for pricing. We do ship Internationally, *PLEASE* read over our shipping policy before purchasing. Average transit time for International orders is 2-4 weeks. Tracking and insurance for are available for an additional cost, please message us if you would like to obtain either for your order. 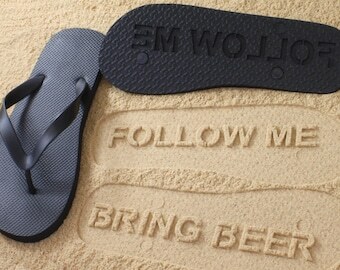 FlipSideFlipFlops is not responsible for delays in International shipping due to Customs or the receiving postal service. Wholesale pricing is available for those who wish to buy in larger quantities. Please send us a message with your email address and any questions you have for more information. Not comfortable but very fun in the sand! We are very sorry to hear that you are disappointed with the amount of time that it took for the US Postal Service to deliver your order. During the holiday season we make an extra effort to produce and ship all orders quickly. You’ll notice that we actually shipped your order 6 days earlier than the estimated ship date provided to you by etsy.com. However, the US postal service took 7 business days for delivery instead of the usual 2-5 business days. In spite of our efforts, this meant delivery occurred after Christmas. The US Postal Service processes an extremely high volume of packages during this time of the year and delays can occur. 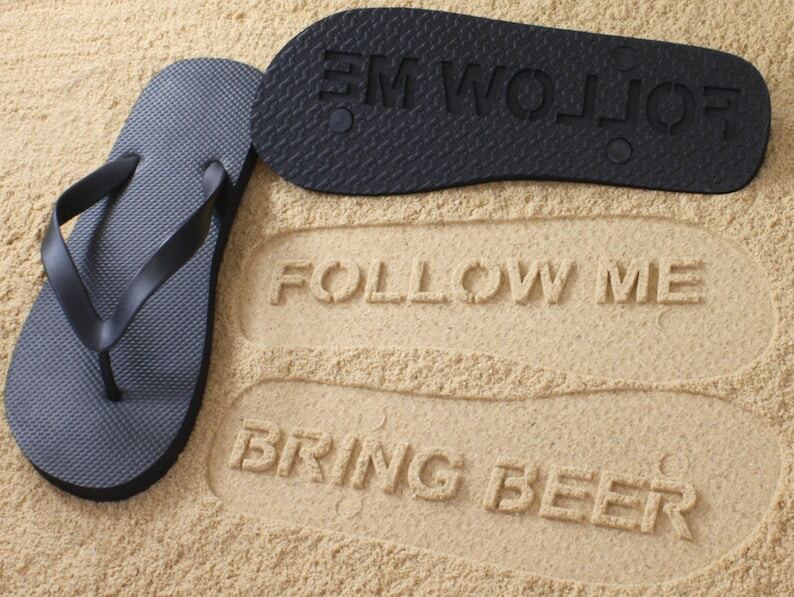 Unfortunately, we have no control over these kinds of situations and we hope that this shipping delay will not diminish your enjoyment of your new custom flip flops. 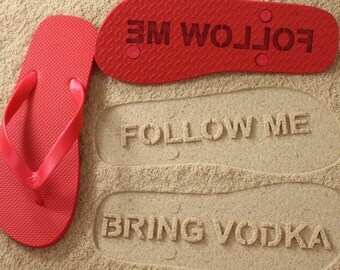 Every pair of flip flops is hand-made to order to the customers' specifications. 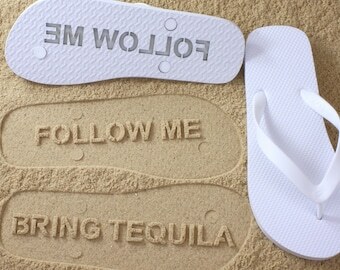 We do not stock or sell pre-imprinted flip flops. For this reason refunds and exchanges are typically NOT accepted. 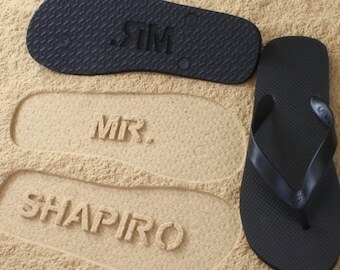 If an error occurs on our part, and we send flip flops that are the incorrect color, size, or sand imprint sole design; the flip flops will be replaced with a correct pair fully at our expense. We also do not typically accept returns or exchanges due to color differences between our product and how they appear on computer monitors. Colors may vary due to differences in monitor settings and we strongly encourage customers to contact us with any questions. If a circumstance arises in which the customer ordered incorrectly (needs a different size, wants a different color, or mis-typed their design, etc…) we reserve the right to approve exchanges on a case by case basis. If an exchange is approved, we may ask the customer to cover shipping expenses or a portion of the cost for a replacement pair. If you have any questions regarding returns please message us. 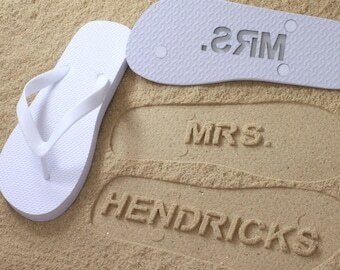 We do not issue refunds or send replacements for flip flops that are delayed, lost or damaged in the mail. If you have questions regarding a delayed or missing package, please contact your local post office for domestic orders or your country’s customs office for international orders. See our shipping policies for more detailed information. 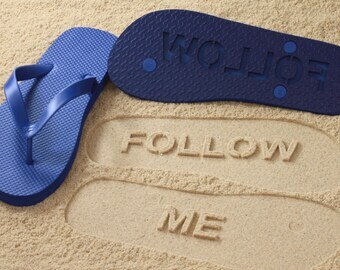 Remember, each and every single pair of FlipSidez is carefully hand-made to order and that process takes time. Thank you for your patience as we work to provide you with a unique, quality, handmade product. Orders are made according to when they are received. If you have a deadline to meet, message us! We'll let you know if we can make it work for you. Wondering when your order shipped? Not to worry! We'll upload tracking to Etsy and send a confirmation message to the email address provided at checkout. Within the United States: 5-8 business days for production; then 2-5 business days for shipping. Standard Domestic Shipping automatically includes package tracking. Outside the United States (International): 5-8 business days for production; then 2-4 weeks for shipping barring any customs delays. Standard International Shipping does NOT automatically include package tracking, but it can be added. Contact us for pricing. Unless you've already contacted us, your package will be shipped via Standard Mail with the United States Postal Service (USPS). We offer Expedited Shipping for Domestic and International orders. Contact us for pricing if interested. Remember, your package may not automatically include tracking! When your order ships, you'll always be able to track it until it leaves the United States. After that tracking may stop updating depending on the destination country. Rest assured your package is still on it's way. Shipping time can vary widely depending on what country you hail from. We ship to hundreds of locations worldwide and will do everything possible to make sure your package arrives quickly. Your package could be travelling thousands of miles on a plane, a boat, or both! Customs procedures and local mail systems are very different for each country, and there's always the chance of extra delays when customs process your package into their system. Many international orders don't encounter delays and spend only 2 weeks in the mail. Unfortunately, when there is a delay packages may take several extra weeks to arrive. In these rare instances, there is very little information we can find out. If you haven't officially upgraded your order with package tracking, the best thing is to be patient! We promise your package still exists and will make it's way to you in time. If a package is returned to us we'll contact you ASAP with re-shipping options. Because so many things can impact International shipping time, we hope you'll understand that we can't guarantee when packages will show up on your doorstep. All goods are declared at the lowest legal value possible on the customs declaration form. When packages shipped outside the U.S. reach the destination country there is a chance additional taxes, duties or fees will be assessed. These costs are the sole responsibility of the addressed recipient and cannot be paid for in advance. It is not possible to circumvent these fees on behalf of any customer. We are only able to pay what the Postal Service requires to ensure the package reaches the appropriate destination country. This is reflected in the shipping cost already included with your purchase. For more information, please contact your local customs office. If your item is a gift shipping to someone other than yourself, let us know. We will ALWAYS do everything in our power to make sure your package is shipped with enough time to get from us to you. While we can never 100% guarantee arrival dates for packages, our estimates are usually very accurate. Because we don't work for the post office, we can't control or anticipate delays with their (or any shipper's) service. We usually do not issue refunds or send replacements for orders that encounter delays beyond our control. If your package is returned to us because of a mistake we made, we'll gladly reship the package at our expense. If a package is returned due to an error on your part; like an incomplete address, package is unclaimed, etc...we may ask that you cover a portion or all of the cost to re-ship the package. 1. How long will my order take to arrive? Within the United States: 5-8 business days for production; then 2-5 business days for shipping. Outside the United States (International): 5-8 business days for production; then 2-4 weeks for shipping, barring any customs delays. 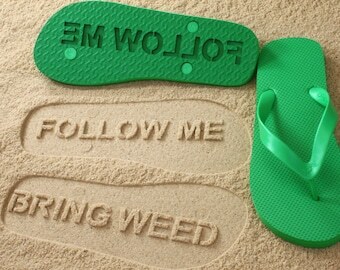 FlipSidez operates and ships from the United States. All goods are declared at the lowest legal value possible. Some countries may require taxes be paid on consumer goods that have been purchased from a foreign vendor. In some cases, customs may hold the package indefinitely until these fees are paid. Any fees assessed by customs are the sole responsibility of the address recipient and are not included in our shipping prices. If you would like more information or have any questions about this policy, please feel free to message us (also see the Customs Clearance portion of our shipping policy above). 3. 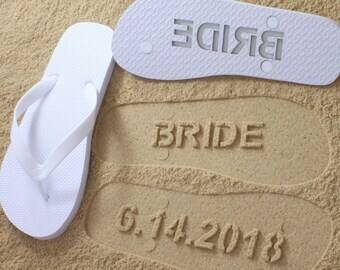 Can you deliver the flip flops by a specific date? It's definitely possible. We can be very accommodating depending on the time of year and try to avoid additional costs whenever possible. If you have a specific need by date, let us know and we'll explain what needs to happen to deliver in time for your needs. 4. I have a long design, will it fit? If your design is longer than these recommended length, we might still be able to make it work. If you're not sure something will work, just contact us with your desired design and we'll let you know if it can be done. 5. I want to add a symbol but I don’t see it on the symbols sheet, can it be done? Usually the answer is yes! If you have a symbol in mind but don’t see it, send us a message or leave a note in the “notes to seller” section of the cart when checking out. 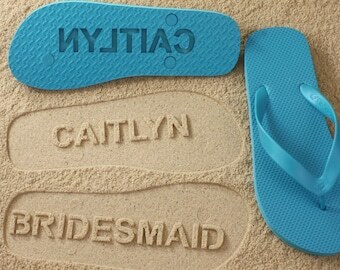 We will get back to you and let you know if we will be able to accommodate your custom symbol request. 6. Why is the processing time on my order so long? Depending on the time of year we may have higher than usual order volume. Longer turnaround times are most typical during the summer months (May, June, July and August). 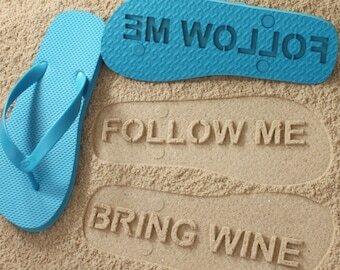 Because every pair is hand-made to order, it directly impacts how quickly we can make flip flops. If you need your order delivered by a specific date, let us know.